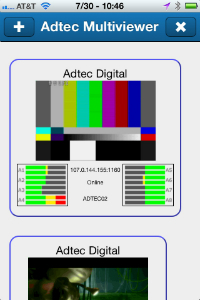 Adtec Digital: video encoders/decoders for satellite trucks. Nashville, Tennessee (July 31, 2013) – Adtec Digital, the global market leader in compression solutions, today announced the launch of their new iOS® Multi-Viewer mobile application, the first of its kind in the industry. The Multi-Viewer mobile application allows users to monitor and control real-time video transmission and manage multiple Adtec encoders and IRDs locally or remotely. The Multi-Viewer mobile application can be accessed with internet connected devices on demand, at any time and from anywhere in the world. Available for use on the iPad®, iPhone®, or iPad Touch®, the Multi-Viewer is free on iTunes® and in the Apple Store, requires iOS® 5.0 or later, and is optimized for iPhone® 5. It is available in English, German, Northern Sami, and Spanish. The Multi-Viewer platform will continue to evolve as future products are released.